Filed under: Art,Fun,Photography,Things to Read — Posted by the Network Geek during the Hour of the Hare which is terribly early in the morning or 6:00 am for you boring, normal people. As implied last week, here are some more photography blogs to follow. Filed under: Fun Work,Life, the Universe, and Everything,Red Herrings — Posted by the Network Geek during the Hour of the Dragon which is in the early morning or 8:27 am for you boring, normal people. I hate to admit it, but when I write on this blog, or any of my blogs, really, I often find myself floundering about. Filed under: Advice from your Uncle Jim,Deep Thoughts,Life Goals,Things to Read — Posted by the Network Geek during the Hour of the Monkey which is in the late afternoon or 5:20 pm for you boring, normal people. On this day, in 1660, arguably the most famous diarist in history, Samuel Pepys, made the first entry into his personal diary. Filed under: Art,Criticism, Marginalia, and Notes,Fun Work,Things to Read — Posted by the Network Geek during the Hour of the Tiger which is terribly early in the morning or 5:24 am for you boring, normal people. It may be obvious by now, but I’m not a graphic designer. Still, I appreciate the work. I mean, I understand the effort and appreciate the people who put in the work to make good design. And, I have to admit that design, good and bad, fascinates me. So, to make amends for my various bad design, I offer the few good designers who might stumble across my site some nice bits. I don’t know about full-time, professional designers, but I need a good bit of inspiration now and again. I often get photography and graphic design magazines just to stare at and get ideas. But, they get very proud of those magazines and charge dearly for them, so, in this new, tighter economy, what are we to do? Well, why not look at free, on-line design magazines! How about 42 Free Online Magazines for Designers? Need more inspiration? Well, personally, I’m obsessed with logos, so I found the Logo Designer Blog endlessly entertaining. Of course, when we’re creating for the web, content, as they say, is king. In this case, that means words. Lots and lots of words. In marketing school they called those words “copy” and the process of churning them out was “copywriting”. It’s an art, too, in its way. An art that all too many graphically creative people don’t seem to get, especially on the web. At least, I’ve seen a lot of sites that sure could use work on their words. Well, GrokDotCom has help for them at the GrokDotCom Ultimate Copywriting Cheat Sheet. Even if you think you’re very good at this, this page is worth a look. Trust me. Filed under: Criticism, Marginalia, and Notes,News and Current Events,Personal,Red Herrings — Posted by the Network Geek during the Hour of the Tiger which is terribly early in the morning or 5:35 am for you boring, normal people. I made my first, primitive blog entry here nine years ago today. Back then, I coded every page by hand, often in a text editor and uploaded the pages. That was back before blogging was cool and everyone was doing it, too, so there just wasn’t any blogging software to speak of. Everyone who had a blog, which is short for “web log”, wrote their posts and pages by hand. Of course, I was mostly out of work back then, too, so I had lots of time to code it all up and link everything by hand. Thank God that all changed! First MovableType and then WordPress. Who knows what else will be coming next? Of course, a lot has changed in my non-digital life, too. Married then divorced again. Changed jobs four times. Moved once, after buying a house. Survived cancer. Sometimes, looking back on it all, it sure does seem like a lot happening in a short amount of time. It’s crazy, crazy stuff. Anyway, I noticed that the date was coming not too long ago and I thought I’d point it out. Filed under: Advice from your Uncle Jim,Fun,News and Current Events,Red Herrings — Posted by the Network Geek during the Hour of the Tiger which is terribly early in the morning or 5:32 am for you boring, normal people. So, the military is concerned about their image. I get that. Blogs and other on-line media are incredibly popular and a source of information and opinion that may influence readers. I get that, too. But, the Air Force is so worried about this they apparently have a flowchart to help counter-bloggers do their work. At least, if Wired is to be believed, they do. Actually? It’s not a bad suggestion for how anyone might respond to a blog post or a comment on a blog post that they don’t like or with which they disagree. Seriously. Check it out. "It's nothing against you to fall down flat, but to lie there--that's disgrace." Filed under: Advice from your Uncle Jim,Deep Thoughts,Life, the Universe, and Everything,Personal — Posted by the Network Geek during the Hour of the Tiger which is terribly early in the morning or 4:55 am for you boring, normal people. Just a short entry today. I was tired last night and went to bed reasonably early, for me. Not sure if it’s the lack of cable or what, but I’ve just felt a little more tired this week. But, still, it’s Wednesday and time for, well, something. Some thought or some vague semblance of a statement about, well, something. Because it’s Wednesday and, if you look back at the last couple of months archives, you’ll see that the pattern is for me to post something on Wednesday. Or, more precisely, to post something every other Wednesday. That pattern of posting has become a promise of sorts. A promise of consistency to the small hand-full of readers who still show up to see what strange ramble, screed or rant I’ve thrown against the wall. Will it stick? When I think about it, it bothers me a little that I’ve written so much here, but so few have read it. I suppose that my playing it safe and being careful what I write has lead to that steady decline in commentors, if not readers. Oddly enough, when I was in the middle of my divorce and not caring at all who saw my raw emotions was, perhaps, the hey-day of this blog, its peak. But, then, as I started to worry and fret over future employers seeing this blog and thinking that I might alienate them, or potential dates, via something that I wrote, my topics changed and got safer and my audience dwindled, or at least changed. I don’t know what that all means, really, other than the fact that I’ve noticed it. Oh, thankfully, there are a few die-hard fans who stick with me, even through the boring, normal life periods like this one. If they hold on long enough they know that things will turn and I’ll get hooked up with a disgruntled house-wife looking to score some Hemingway or some Poe, maybe if I’m lucky, she’ll be looking for Lovecraft. Then things will get lively again with tales of being shot at by angry husbands or chased by dogs. Or the cancer will come back and give me something to whine about. Or some other horribly funny tragedy will befall me and compel me to write about it, much to the amusement of … Someone. In the end, of course, I’d probably write this blog just to write. I don’t think I could keep from writing it, not even if I wanted to! And, in the end, I suppose the compulsion to write is as good as any excuse to spit up these words on a page for everyone to read. So, I’ve got that going for me. Filed under: Criticism, Marginalia, and Notes,News and Current Events,Personal,Red Herrings — Posted by the Network Geek during the Hour of the Tiger which is terribly early in the morning or 5:50 am for you boring, normal people. I don’t particularly feel like writing today, but, well, it’s time for an update. Okay, that’s not quite true. I just don’t feel like writing anything that I feel comfortable sharing on the blog. Not that I have anything in particular going on, really, but there’s just no way for me to talk it through, so to speak, in writing and have it come through in a way I’m willing to put on the web for all to see. That may surprise some of my readers, considering what I’ve thrown out in the past, but there it is. The picture here is one of several stacks of books in my house that make up my “to be read” queue, or, as I think of it, pile. If you get in close, you’ll see a strange combination of subjects. 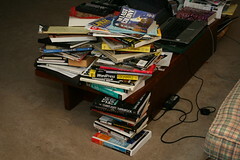 At the bottom of the stack, there are books on chemistry, space flight, the Yakuza and gun running. All basically purchased for research for a semi-mythical story that will probably never get written. Still, these are all things that interest me anyway, so I figure it’s money well spent. The next layer up is computer books. Specifically, books related to WordPress and web design or web page creation. These are all meant to help me build a better theme for this blog, and my other blogs. Not to mention potentially making a theme that other people might like to use and possibly even donate a bit of money to use. At least, that’s the idea. The rest of the books are a mish mash of assorted subjects that have interested me to a greater or lesser degree over the past several months. So, there’s an update of sorts to keep the Google-gods and blog-spirits happy. Ciao!